To me, cooking from the Goldilocks Bakebook is a bit like time travelling - like hopping into that car from “Back to the Future”. Everyday throwbacks like these are why Filipinos love the Goldilocks bakeshop so much. I’ve forever been fascinated with how desserts like lengua de gato (French butter cookies shaped like a cat’s tongue), crema de fruta (sponge cakes layered with custard, gelatin and fruit) and mocha chiffon cake with buttercream icing became so popular in the Philippines. Certainly, none of these were native to our islands! But with Milagros Yee and Clarita Go’s genius in growing the Goldilocks brand the way they did, these special cakes became a part of peoples’ lives, not just as a treat for birthdays or family gatherings, but as a part of mainstream Filipino food culture. We’ve claimed them as our own - indigenized them, in the words of Doreen - and in the process made room for baking enthusiasts of all ages, all over the world, to tell a uniquely Filipino story. “In 1965, Milagros’ baking expertise became quite famous among an unlikely audience,” the book tells us. At the time, Milagros was a nurse, and when her sister Clarita gave birth to a premature son, she “expressed her gratitude to the attending physicians and her fellow nurses the best way she could” by bringing them samples of her specialty, the tube pan cake (similar in shape to a bundt cake). “Before she knew it, repeat orders began pouring in,” and when Clarita recovered enough to travel to Manila, they both enrolled in baking classes to “perfect the chiffon, sponge and butter cakes” which make up the majority of Goldilocks’ bestselling cakes, even today. They opened their first bakery a year later, in a 70 square meter space in Makati, that had “two display cases and ten employees to bake, cook and pack several products.” On their first day, they sold out of everything. I’ve always struggled with giving my dough enough time to rise, and now that I’ve nailed bread rolls with the look and feel of what I’d call well-risen dough, I feel so much better. Finally, I’m getting somewhere! After two years of kitchen-testing recipes written in the Philippines, the biggest baking lesson I’ve learned is to double the amount of time for rising. Leaving something at “room temperature” clearly won’t produce the same result in Canada - my kitchen will just never get up to 30 C nor be anywhere as humid as a tropical country. 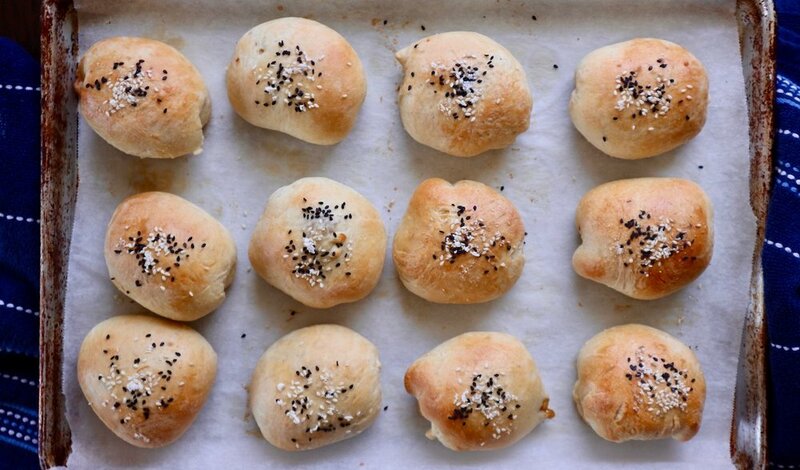 Meat-filled buns (page 9) are a sweet thing to make a lot and enjoy over time. 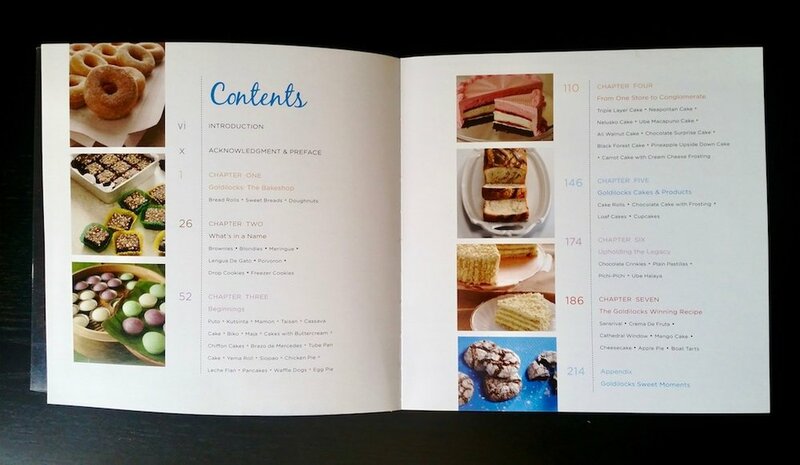 I was pretty happy with how the star anise-scented chicken and honey filling (page 13) turned out. Somewhere between Christmas and New Year’s, I decided to make a batch of brioche buns because I was craving for buttery ensaymada topped with salted eggs and cheese (page 17). Thanks to deep winter, I ended up waiting for my bread to rise most of the day! But I knew it’d be a weekend project and came prepared with a good bottle of wine. I’m pretty sure I also watched several episodes of Terrace House that weekend. 2014 me is not the same as 2018 me. With that said, I remember labouring intensely over making homemade siopao asado for the first time - definitely not something that only Goldilocks carries, but one that I knew well from the bakery chain. Good things don’t come easy! These cookies are honestly super easy to make. I remember making them A LOT when my parents bought a toaster oven, around the time my younger sister was born. We made them with ingredients we usually had, like flour, sugar, eggs, cocoa powder and a touch of vanilla extract. The best part was always sprinkling icing sugar on the warm, crinkly cookies straight out of the oven (and then popping one straight into my mouth). This one’s a bit of an obsession. Sans rival is a French dessert comprised of layered meringue, chopped cashews and buttercream icing as it was meant to be (made with whipped butter and sugar). I’ve made several sans rival cakes over the years and still call it a work in progress, especially when it comes to baking a light, fluffy meringue. It tastes great every time, though! Without rival, indeed. My lola loves black forest cake. And so do many loyal Goldilocks fans! There’s just something about the time and place this cake evokes, like it takes you right back to the height of cosmopolitan Manila in the 50s and 60s. Reading the recipe, it shouldn’t be hard to replicate. This cake is about as American as Filipino cakes get. With layers of chocolate cake, whipped cream and cherry pie filling - topped with curls of chocolate and shiny maraschino cherries - I just know there’s a deeper story here around the role that American desserts played as a status symbol, for wealthy families and those who aspired to be them. If the term “instagrammable” existed then, it would accurately describe a slice of black forest cake! I imagine most people who buy this book consider the mango cake on the cover to be the pinnacle of Goldilocks cakes. I have yet to make it myself and will update this post when I do - hopefully with mangoes from the Philippines!